5" closed framelock. 3 1/2" black finish AUS-8 stainless drop point blade with dual thumb studs. Front of blade etched with Randall's Adventure & Training logo. Back of blade etched AVISPA with logo. 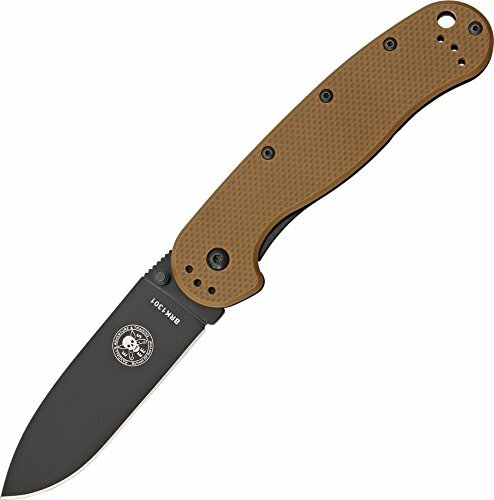 Textured Coyote Brown glass filled nylon front handle. Black finish stainless back handle. Lanyard hole. Four way reversible black finish stainless pocket clip. Made in Taiwan. Note: AVISPA is Spanish for wasp. Designed by Esee. Blue Ridge Knives Exclusive! 3 1/2 inch black finish AUS-8 stainless drop point blade with dual thumb studs. Front of blade etched with Randall''s Adventure & Training logo. Back of blade etched AVISPA with logo. Textured Coyote Brown glass filled nylon front handle. If you have any questions about this product by BRK Designed by ESEE, contact us by completing and submitting the form below. If you are looking for a specif part number, please include it with your message.